"Wagner: Das Rheingold: Metropolitan Opera" (2011) on Blu-ray -- Live Opera Recording! "Wagner: Das Rheingold" (2011), Blu-ray. 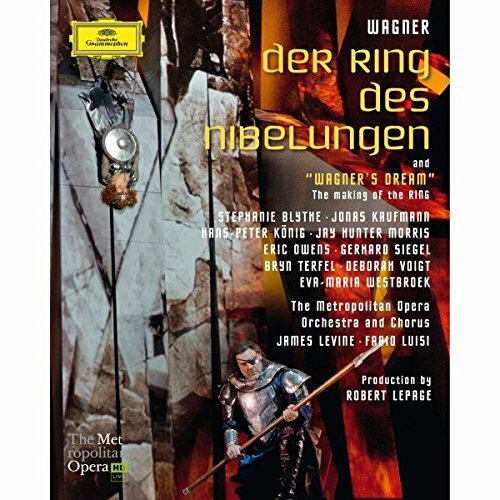 Disc 1 of 5, from the boxed set, "Wagner: Der Ring Des Nibelungen: Metropolitan Opera" (a 2012 Release; an October 2011 Live Performance). A Deutcshe Grammophon release. HD Extras include a 3 minute interview with Bryn Terfel, who sings the god, Wotan, and an 8 minute piece covering various aspects of rehearsal: Orchestra, chorus, principle singers, costumes and staging. See professional opera singers get scared out of their wits as they dangle from wires WAY above the stage! NOTE: The boxed set also includes a fifth BD -- a 2 hour long documentary on the making of this new, Met production. REFERENCE QUALITY, LIVE PERFORMANCE PQ AND AQ! In September, 2010, the Metropolitan Opera in New York premiered their new production of Wagner's four-opera epic, "Der Ring Des Nibelungen" -- composed over 26 years, between 1848 and 1874, and first performed as a complete "cycle" in 1876. Five years in the making itself, this new, Met production featured the conceit of a single set for all four operas -- a set designed to reconfigure itself mechanically in real time, and enhanced with digitally produced projections which actually responded to the motions and voices of the singers! The first two operas ("Das Rheingold" and "Die Walküre") premiered in their 2010-2011 season. The last two operas ("Siegfried" and "Götterdämmerung") premiered in their 2011-2012 season. And the complete cycle of all 4 was presented in their 2012-2013 season. The Met also does HD simulcasts of many of its live performances to movie theaters all across the country. This disc records the HD simulcast of their October 8, 2011, performance. And it's a real treat! The design for this new production was done by Canadian playwright, actor, film director, and stage director, Robert Lepage -- who has also designed productions for Cirque du Soleil. The layout consisted of a wide front apron near the orchestra, behind which was a shallow pit, over which loomed -- The Machine! The Machine is an array of truly massive beams running front to back and supported on a central, horizontal, cross-axis like a seesaw. The cross-axis itself was supported by towers left and right in such a way that the whole contrivance could be lifted WAY into the air. When lowered down, with the beams horizontal, you ended up with a floor extending back from the apron area. When raised up, with the beams vertical, you have a wall over the pit behind the apron. But each beam can also be SEPARATELY oriented. So you can get many configurations in between -- sometimes shifting between configurations DURING the performance. And then, Lepage designed in wire-work! Think about that: These extraordinarily expensive, world-renowned opera singers could be suspended from wires so that they could, e.g., float up in front of the beam wall (as with the Rhine Maidens swimming in the Rhine) or do the seemingly impossible walk up or down it when configured as an incredibly steep ramp. Or even SLIDE DOWN that ramp into the pit -- presumably safely because the rate of descent was controlled by their wire rigging. TRIVIA: To do some of this stunt work the singers had to wear wrestling shoes to get sufficient traction on the beams! But wait, there's more! These beams themselves are featureless. But the production includes computer controlled digital video projections played against the beams. These are not simple, static images. The singers wore sensors so that the computer could ANIMATE the projected, digital imagery in immediate response to the motions of the singers or the volume of their voices! So in this opera, you have a scene where the Rhine Maidens have swum up to a high bank -- well up the beam wall -- and are teasing the lustful gnome, Alberich to come catch them. The projection on the beams shows the bank as a steep slope of river stones. And as Alberich tries to climb up to them (going up-slope supported on his wire) the animation kicks the projected stone images back DOWN slope -- individually and in little avalanches -- in response to his hand and leg motions! TRIVIA: The original software designer had to be replaced when he suffered a nervous breakdown. The Machine is IMMENSE. The whole thing weighed so dang much the Met had to spend a pile of money on physically reinforcing the floor of their stage! And, as you can imagine, it didn't always work smoothly. Rattles, groans and squeaks were common. One performance started 45 minutes late due to some last minute repairs. In rehearsals, broken machinery caused injury to stage hands. And one singer had to be plucked away at the last moment from being crushed to death! But the Met never had to interrupt an actual performance once it got started, and nobody was injured during any of the actual performances. This is counted by the Met as a success! TRIVIA: The closest they came to having to interrupt things was in one performance when the digital projections were replaced, briefly, by the Microsoft Windows logo! Truly, the visuals achieved with The Machine are pretty dang impressive! The descent into Nibelheim is presented with the beams formed in a spiral -- nearly vertical on the left and nearly horizontal on the right -- and moving to change configuration AS the action proceeds. The singers appear to "step down" that slope from left to right. How? On the left they are hanging from wires, in front of the wall, and miming their steps! It is remarkably effective. Coups de Théâtre aside, the Met put together a spectacular cast for this prestige production. The God Wotan is sung by Bryn Terfel. Alberich the gnome is sung by Erich Owens, the trickster Loge is sung by Richard Croft. All three do a great job! The female leads are equally impressive, although the female roles are less prominent in this opera than in the following three operas. James Levine, Musical Director of the Met, and only recently recovered from crippling back problems, surprised all by returning to the podium to conduct. As fascinating as the production happens to be -- complete with the frisson that comes from wondering whether you might actually see these artists plummet to their deaths or be crushed under inexorable, moving metal -- the real treat on this disc is the Audio. The performance is top notch -- singing, conducting, and orchestra alike -- and the Met has long since learned how to mic properly to capture every nuance of that. This is an exceptional audio recording even if it doesn't feature high bit-rate, HD Audio credentials. Picture Quality on this transfer is similarly impressive: Technically flawless, and with wonderful detail and color gamut. Optional subtitles are also available, and very well done. My only complaint is that the Director of this HD simulcast -- Gary Halvorson -- is of the school which thinks opera should be shot in close ups. Lots and lots of close ups. You DO get to see the full staging from time to time, but far too much of the time is spent in close ups. Now, the Met's production values are such that the singers' makeup and costuming really do stand up to such close inspection. So you are not going to be laughing at these singers as is the case with some operas shot on video. But a production like this is meant to be seen in total -- not one singer at a time. For those unfamiliar with Wagner, you should know up front that he was much better at music than he was at story telling. His plotting leaves a lot to be desired. But go with it. It is intended to be fabulous. And full of deep import. This first opera gets the whole shebang going when we learn Wotan -- who among other things (and this is crucially important) is the God of contracts and justice -- has decided to renege on a deal! Meanwhile the gnome Alberich has been lusting after the three Rhine Maidens, who, in addition to teasing him, are charged with protecting the Rhine Gold from thieves. They don't mind telling HIM all about the gold, because, they explain, the true magical powers of the gold can only be tapped by someone who rejects all earthly love. And since Alberich is just a bundle of lust, they know HE'LL never be a problem. Alas, they have entirely underestimated the attraction magical gold has for gnomes! Alberich steals their gold and from it fashions a ring of power, and a mesh like "helmet" which lets him change shape or become invisible. With these he takes control of the underground world of the gnomes, Nibelheim, and plots to take over the world entire! Eventually the Giants come to Wotan to collect their payment, and Loge convinces them to accept an alternate deal: The Rhine Gold! The Giants take Freia hostage, which sort of puts an edge on things because the Gods need those darn apples. And Wotan and Loge descend to Nibelheim to confront Alberich, trick him, and take HIM hostage, until he ransoms himself off with the gold. Including, you'll remember, the ring and that helmet. Wotan knows a good, magical ring when he gets his hands on one, and when the two Giants return with Freia he determines he'll give them all the gold -- even the helmet -- but *NOT* the ring! At which point the mysterious Erda appears and warns Wotan that really REALLY nasty things will happen if he keeps the ring. So he hands that over, too. Freia is returned, and Erda's warning seems to take immediate shape as one Giant slays the other to keep the ring, and all the rest of the gold, for himself! As the opera ends, Wotan and the Gods ascend to their new, trophy-home -- with Wotan making mysterious statements about his cunning new plan for this home, which will make everything right with the world once again. Loge, who is only a HALF-God, mutters about these fools of Gods who think they are TRULY immortal. Maybe, he ponders, he'll have to DO something about that. But that's a tale for three additional operas!